When to Replace Your Cabin Air Filters - VIP Autos | Hemet | CA. I called a good friend of mine to ask when will I get an invite to see his new house? He said ” You will if it doesn’t burn down” needless to say my friend and his family live in the San Marcos area. The following day the smoke was blown into our valley affecting our air quality. Although the air quality in Hemet is good according to statewide air quality reports the smoke from the fires made it difficult to breath for a lot of people in our valley including Yours Truly, only to find relief inside or in my car with the cabin air filter. This leads me to our topic of the day; When to replace our cabin air filters. 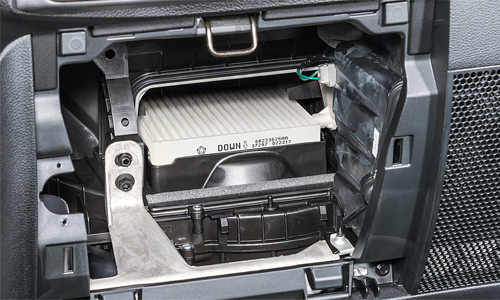 The cabin air filter, a feature found on most late-model vehicles, cleans the air that comesinto the interior through the heating, ventilation and air conditioning system. It catches dust, pollen and other airborne material that can make riding in a car unpleasant, particularly if you have allergies or other respiratory problems like I do and did from the fires. Some signs that you need a new cabin air filter are reduced air flow through your HVAC system, such as when you crank up the fan too high and you get more noise than results. Another is persistent bad odors. Even if you don’t have these warnings, you should have the filter checked at least once a year, and you may be able to do that yourself. So hope this tip gives you a breath of fresh air. Purchasing a car for the business has many tax advantages!